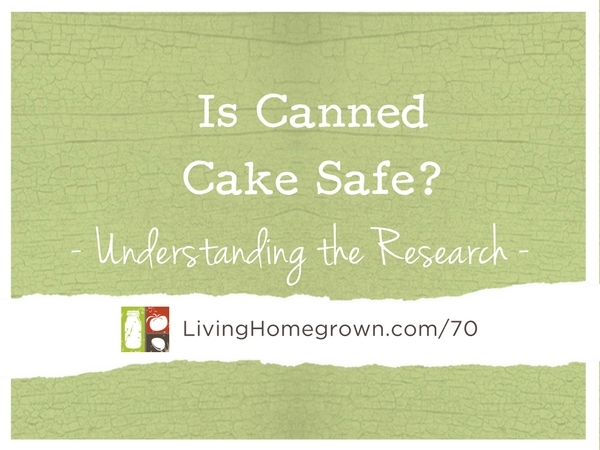 LH 70: Is Canned Cake Safe? In this week’s episode, I answer a question from a listener named Sharon. She wants to know if it is okay to make “canned” cake. Every year especially around holiday time you’ll see these recipes floating around the internet. It’s for canning cake or canning bread. First, it’s called “canned” but it’s not processed in a canner. It’s baked. Second, we’re not talking about bread exactly. 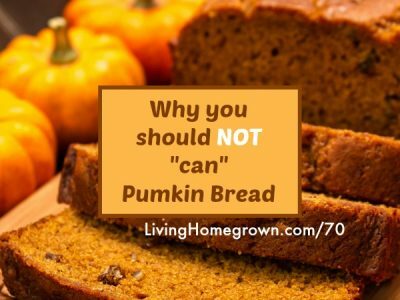 It’s really like a tea bread such as pumpkin bread or zucchini bread. A “canned” cake recipe calls for baking this bread or cake in the jar and then pulling it out of the oven and putting on a lid and a ring. As the jar cools, it makes a seal. Every year, some well-meaning canners think they have the safety portion figured out. But unfortunately, the research shows otherwise. I know it sounds nifty, but it turns out…its not really a safe practice. In this episode, I dive deep into the how the research was done, what was discovered and how the oven didn’t do what you’d think it would do. Oh my gosh Theresa! I’m so glad that you did this episode. I remember in the early days “canning cake”! So glad I didn’t poison anyone! Thanks again for staying on top of these things! Yes – Well, for any poisoning to happen there has to be the right bacteria in the jar. Obviously, we were “clean” when we did it. And it could be that we cooked our cake at a higher temp than they did in the research. But knowing what we know now…it’s best not to do it. Whew!